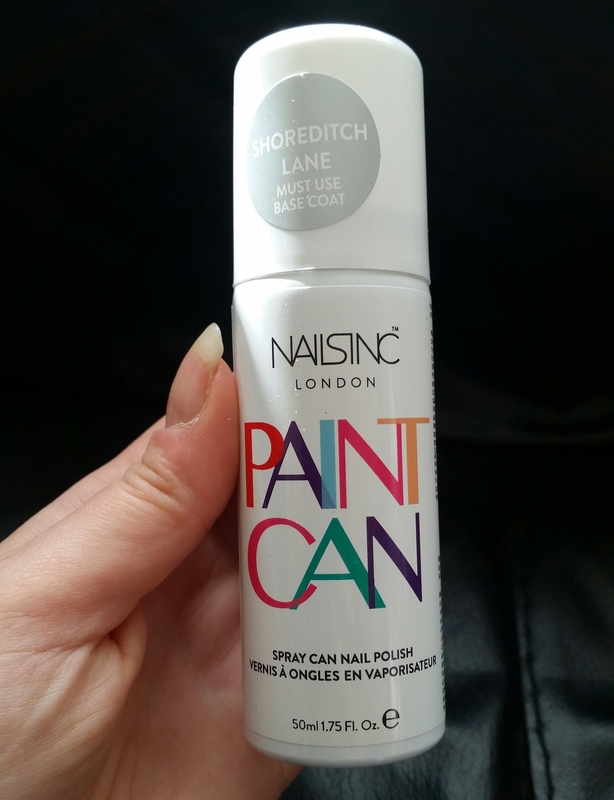 I’ve been keen to try Nails Inc’s Paint Can Spray for quite some time. Online this spray nail polish was constantly sold out, but just recently it’s been released in stores such as Boots. For Easter I was given this nail polish as a gift in the colour Shoreditch Lane and needless to say I was excited to try it! 1. Apply a base coat-You must use a base coat before applying the nail polish or it will not stick to your nails. 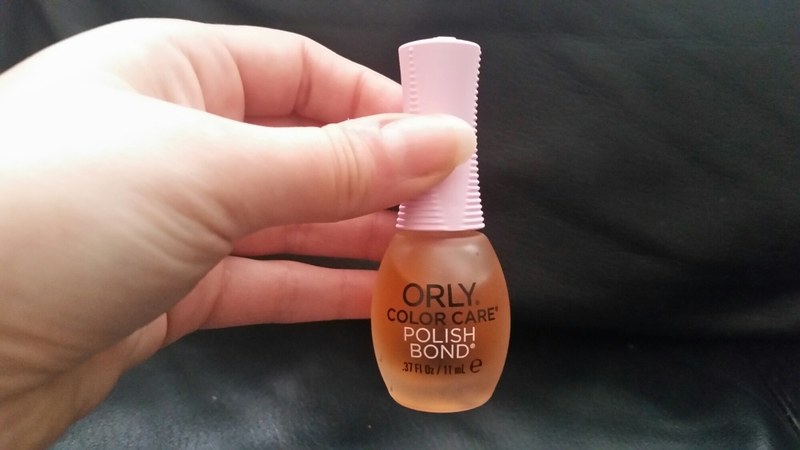 Nails Inc of course suggest you use their base/top coat, but I used Orly’s Polish Bond which is a base coat. 2. Cover surfaces and then spray polish on to nails-Make sure to cover surfaces to avoid staining and then shake the can and spray your nails! 3. Apply a top coat-This nail polish dries very fast and once it has, apply your top coat. I used Orly’s Chip Guard and it really helped bring out the colour of this nail polish. 4. Wash hands with warm soapy water and then you’re done!-If you wash your hands as soon as the top coat dries, this polish is pretty easy to get off your skin. Unsurprisingly, the longer you wait to clean your hands, the harder it is to remove. Below is a photo of the finished product. So these four steps probably sound easy enough, but believe me it’s not quite that simple. The first thing I noticed with this spray is how cold it is, not just a bit cold, but ice cold! My fingers felt so numb when I first tried this polish, that I felt like giving up. After a while it becomes bearable, but Nails Inc desperately need to change the formula! As well as the cold sensation, this spray nail polish takes some time to get the technique right. 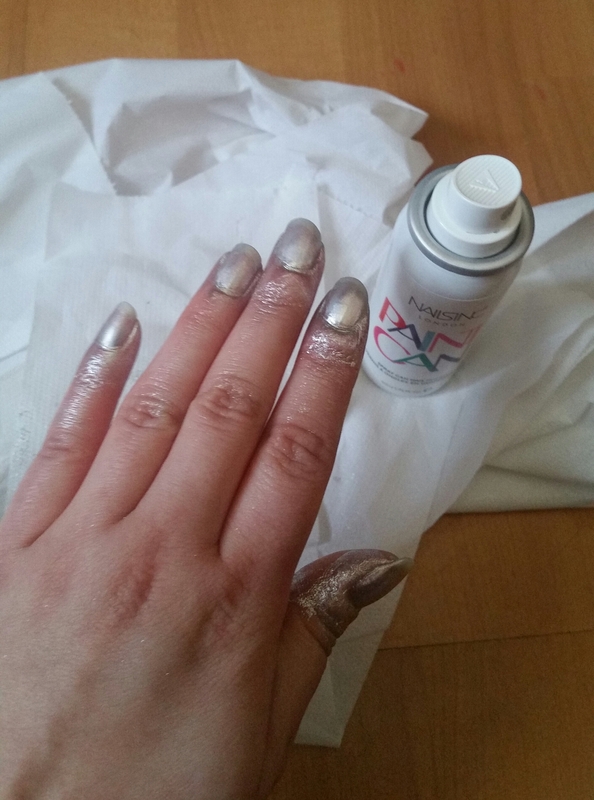 I learned that you need to shake the can before spraying each nail and that gives a good, full coverage. If you spray along your nails in a line, the coverage will be poor. This isn’t a polish that works well if you spray multiple layers on, as it tends to fizz up and go uneven, so make sure you shake the can before doing each nail. 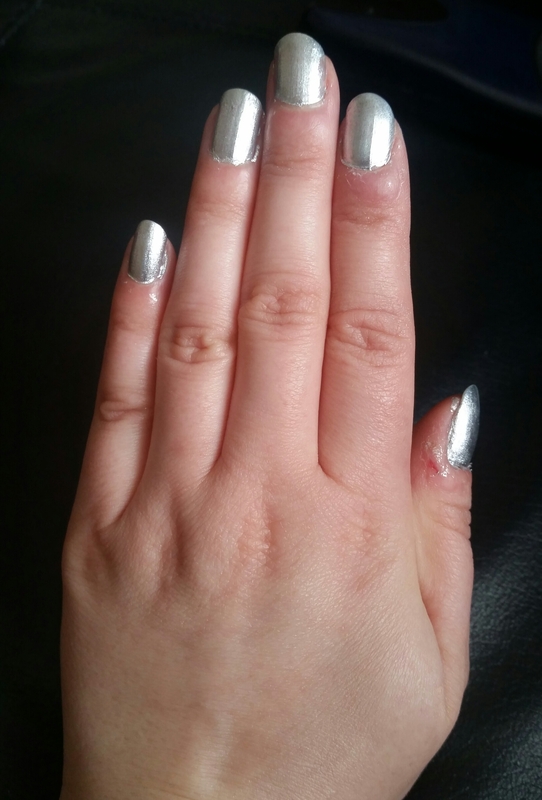 Overall it took me four attempts to get my nails right, so I wasted a fair amount of product, but once you get used to using a spray nail polish, waste should be minimal. 1. Easier to use for those who don’t have a steady hand. 2. This shade Shoreditch Lane is highly metallic and has a beautiful foil finish. 4. Lasted reasonably well (three days). 5. Easy to remove nail polish from skin. 6. A unique alternative to regular nail polishes. 1.The spray can is pretty small and only contains 50ml of product. 2. Due to the spray formula, it’s easy to waste product. 3. When first applied it feels incredibly cold and numbing on the fingertips. 4. It doesn’t give a completely smooth, even finish. So despite not being keen on this spray initially, I’ve grown to really like it! 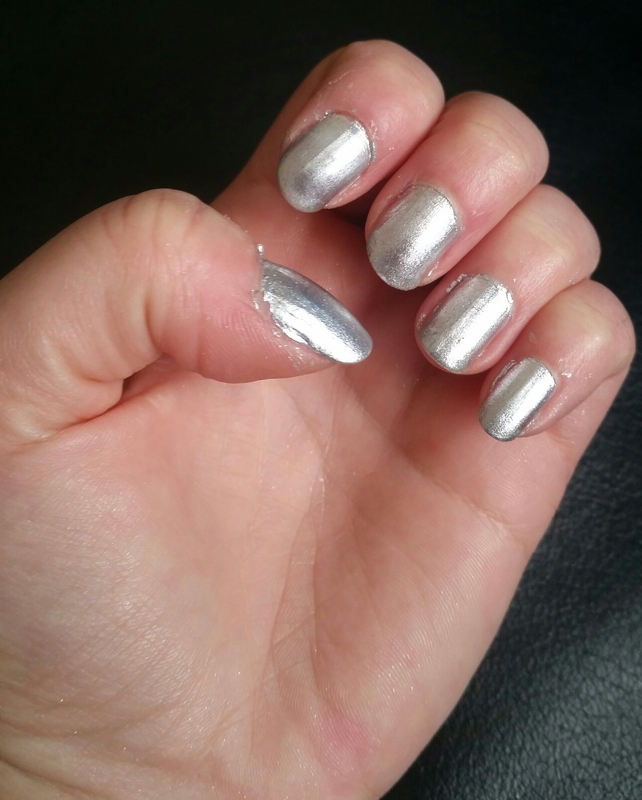 I love the metallic silver shade of this nail polish and how it looks shimmery in different lighting. The only thing that would put me off using this as much, is that it’s painfully cold when first applied and I do feel that this is a bit of a novelty item, but it’s still one I’m glad I’ve tried. Let me me know if you’ve tried this spray on nail polish or if you would give it a go. I would give it a try but I only do pedis. Wonder if they are good for tiny toenails? 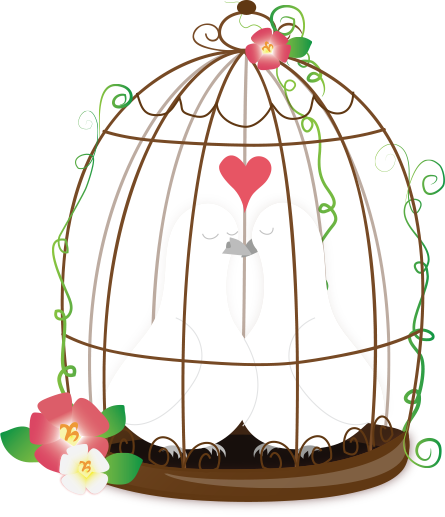 Love the silver colour, looks like you dipped your fingers in a pixie’s bowl of stardust. I would get it to try though. I haven’t tried it yet but I am curious. It sounds interesting but not so practical as traditional nail polishes. How big is their colour range? Awesome review! What an interesting concept…would be nice if it came with more product since there’s already a lot that gets wasted! Been waiting on your review. I don’t fancy trying that. Seems faster to just paint them haha. The principles sounds so easy though. O well, I guess it was too good to be true. Looks really difficult / messy….